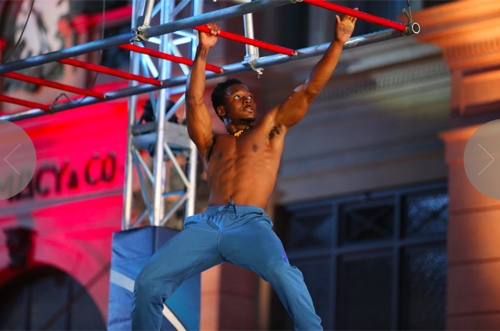 American Ninja Warrior, NBC’s obstacle course competition airs tonight with an all new Monday, August 3 season 7 episode 10 called “Orlando Finals.” We’ve got your recap down below! On tonight’s episode the top 30 competitors from the Orlando Qualifier tackle the Orlando Finals course, which includes the Salmon Ladder, Cannonball Alley, Helix Hang and Invisible Ladder. On the last episode “American Ninja Warrior” traveled back to Houston, Texas where the top 30 competitors from the Houston Qualifier tackled the Houston Finals course. In addition to the obstacles from the Houston Qualifier, contestants were faced the Salmon Ladder, Walking Bar, Crazy Cliffhanger and Invisible Ladder. Top competitors and fan-favorites Brent Steffensen, Sam Sann and Daniel Gil took on the course. The Houston competitors vied for a chance to compete in the Las Vegas finals, to win a cash prize of $1,000,000 and the title of “American Ninja Warrior. Did you watch last week’s episode? If you missed it we have a full and detailed recap, right here for you. #AmericanNinjaWarrior is back at Universal Studios in Orlando for the city finals. Tonight’s course is the steps, rolling log, paddle boards, tire swing and double tilt ladder then warped wall. From there, the salmon ladder, cannonball alley, double helix which is all new and then the invisible ladder. Kyle Johnson is up first – the pro break dancer easily hops the steps and hangs onto the rolling log and he rebounds and bounces back into the water. Wow – tough – the spin just carried him backwards. Next is Alexio Gomes who is dedicating his run to his brother who didn’t make it in the qualifier. He goes slow and careful on the steps then hops on the log. He hangs on tight until the log stops after what happened to Johnson. He moves on to the paddle boards. He makes it through but takes a spill coming off it and moves to the tire swing. He lands that too. Then it’s the tilt ladder. Clears that too. Now the warped wall. He’s up and over then to the back of the course. The salmon ladder takes him to the cannonball alley where he loses his grip and takes a dive. On the break, Adam Williams aka Major America rolled right off the rolling log and then pro wakeboarder Shaun Murray was taken out by the salmon ladder. Stuntman JJ Woods is a Vegas veteran and he quickly runs through the first part of the course. He’s on the salmon ladder and moving so fast. He moves to cannonball alley and the crowd chants. He gets stuck and then flounders and falls. He’s upset that he fell, but he may yet make it to Vegas since he moved fast on the first part of the course. Matt Jordan is next – he’s from a tiny town in South Carolina. Matt makes it through the first three with just a small stumble and then moves to the tire swing. He kills the tilted ladder and takes the warped wall and moves on to the salmon ladder but it takes out the #NinjaButcher. Jojo Bynum takes the course and moves along well. He made it to stage two last year as a rookie. He stops to get his bearings after the rolling log before moving on. He makes it past the tire swings with ease. He makes it through the first half and up the warped wall. Jojo is now on the salmon ladder and then moves to cannonball alley. He grabbed the third but then took a hard fall. He made it farther than anyone else though. James Bogle Jr made it all the way to the salmon ladder but tumbled off cannonball ladder. Firefighter Eddy Stewart fell at the same point – no one has made it past that point yet. Dad and Dr Rich Shoemaker takes the course next. He stops after the log to regain his equilibrium then moves on. The ER doc clears the first half of the course at a good pace then moves on to the salmon ladder. He also tumbles off the eighth obstacle just like all the others before him. Six athletes so far have been taken out by the cannonballs. It took out many in Venice last year as well. Next up is Travis Rosen, a Veteran of ANW for years. He speeds through the first four obstacles easily dealing with the ladder before moving onto the warped wall. The 40 year old seems to be doing well. He moves on to the salmon ladder. Travis is the first to clear the alley! The #TennesseeTrader does it with ease then faces the all-new obstacle double helix but ran out of steam to deal with it. Travis should be safe for Vegas since he made it the farthest of anyone. Sean Clayton was taken out by cannonball alley and Idoko Abuh took a head shot then fell from the salmon ladder. Hunter Sipes made it past the ladder but was the eighth to fall off the cannonballs. Three time Mount Midoriyama veteran Drew Dreschel takes the course next. He speeds through the first several obstacles and heads for the tilted ladder to crowd cheers. He clears the warped wall and leaps on the salmon ladder and goes backwards up it. He conquers cannonball alley too. He stops to autograph his shirt then tosses it to a fan. He moves onto the double helix. He goes for a reverse dismount and saves it after almost falling in. Drew makes it to the invisible ladder but his arms are exhausted. He has to swing his legs to move his body then finally falls after he loses his grip but was just a few feet away from finishing the course. Walk-on Adam Arnold is next and he speeds through the course and makes it past cannonball alley – the Orlando Ninja killer. He moves on to the double helix and kills it. The #WalkonWarrior is now at the invisible ladder. Adam is the first to finish the course! We see a look at the Ninjas hanging out at the theme park before the competition. Next up is rookie John Alexis Jr – the fastest qualifier in Orlando. He runs down just one side of the steps and does the log. The 6’6” ninja then moves on. He stumbles off the paddleboards but recovers and moves on. He moves on but then takes a spill off the tire swing when he gets too aggressive. Back from the break, Reko Rivera breathed fire then fell off the cannonballs. Then walk on Gordon White made it to the double helix before he fell. Now it’s Neil Craver’s turn. He clears the first three but takes a tumble then moves on. He clears the tires then takes the ladders and the wall. He takes the cannonballs with a struggle. Now it’s the double helix. #CrazyCraver will definitely make it to Vegas but he presses on. The crowd chants his name. He gets hungs up and swings and makes an early dismount. He’s tired as he faces the invisible ladder. He won’t stop and is just a few feet from the platform after a huge and slow struggle up there. He falls with just a few inches to go. He was awesome. Next up is Flip Rodriguez who takes off his mask and shirt before his run. He skips over the steps, rolls the log and moves on fast. He conquers the tires then the ladders and warped wall. The salmon ladder is next and he moves to the cannonballs and clears those with ease. Now to the helix. He dominates it and moves on to the invisible ladder. He takes a break then goes for it. He’s struggling and has to use his legs to swing and try to move up. He’s got 10 feet to go. He gets one foot into the circle then falls hard. He was so close and is the closest that didn’t finish. Over the break, Matthew Schuman fell off the ladders and Chad Hohn fell from the tires. That put Alexio Gomes into the top 15. The final runner of the night is James McGrath #TheBeast who is a six year veteran. He dances across the steps, rolls the log like a boss and moves past the next two with ease. The ladders are no problem nor is the wall. Now he’s on the back of the course and facing the salmon ladder. He conquers the cannonballs like there were nothing and moves on to the helix. He makes a backwards dismount like it’s nothing and moves on to the invisible ladder. He’s two minutes faster than anyone else. He starts to struggle too and may not make it. He kicks to try and hang on. He gets in by his ankles and pulls himself up to be the second qualifier and take the top time from Adam Arnold.